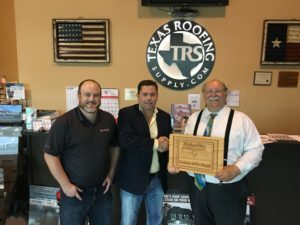 Since opening Texas Roofing Supply in Meadows Place, Brian Slay, President & CEO, says they have been redefining the roofing supply business. Meadows Place is proud to have them recognized as the Meadows Place Economic Development Corporation Business of the Month for June. Pictured l-r are : EDC Director, Mathew Walker, Brian Slay of Texas Roofing Supply and Mayor Charles Jessup who said “Having Texas Roofing pick Meadows Place was quite an honor!” This award is presented to our business partners who contribute to, and support the City of Meadows Place. Meadows Place has great business partners. Please support them whenever possible.